BEST Backyard Greenhouse - NO ASSEMBLY REQUIRED! BEST BACKYARD GREENHOUSE AVAILABLE ANYWHERE! Welcome to Solar Gem Greenhouses – manufacturer of the best backyard greenhouses in North America since 1991. Are you ready to grow your dream garden, year-round, right in your own backyard? Our one-piece and easily portable fiberglass greenhouses are designed for gardening enthusiasts of all skill levels. We make it easy for you by manufacturing a greenhouse that requires no deck, slab, or foundation; no permit required, and no assembly whatsoever (yes, you read that right); is virtually maintenance-free; thrives in both cold and hot climates; shrugs off high winds and snow; comes with a Limited Lifetime Warranty; and is delivered right to your home. What other greenhouse product offers all this?! 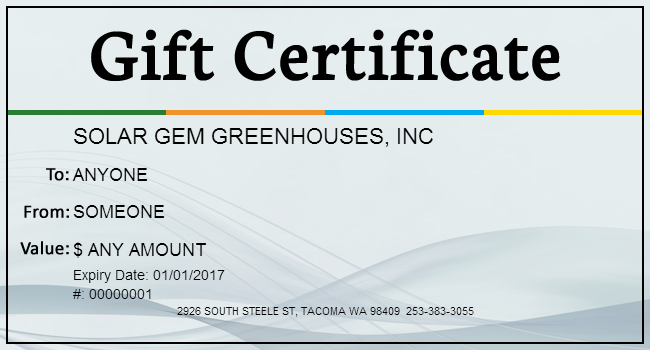 Experience the Solar Gem Greenhouse difference for yourself. We travel all over the country to various events showing off the quality of our amazing backyard greenhouses. Check our CALENDAR to see where we’ll be next. 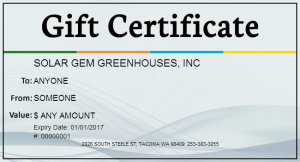 We invite you to navigate around here and see why thousands and thousands of other gardening enthusiasts have confidently chosen a super long-lasting Solar Gem Greenhouse over all other greenhouse offerings available. Thanks so much for your interest. Got questions? Our dedicated factory staff and team of independent Dealers are highly qualified to answer all of your greenhouse queries. Happy gardening! Contact us by phone or email today.